Was that what you were thinking, too? From that scene on, Cronenberg locks onto the Mantles’ spooky synchronicity as it leads to a successful dual career in gynecology, then gradually and tragically begins to dissipate, as they evolve into separate men. As the twins discover, “internalizing the water” isn’t just a cold biological imperative, but something much messier (or sloshier, if you will) and unquantifiable, with an emotional fallout they can’t anticipate. Cronenberg being Cronenberg, he surveys the wreckage from a chilly distance; in fact, if the Mantles were to make a biopic about themselves, it might look a lot like this film, which is characterized by an almost anthropological curiosity over the patterns of human behavior. 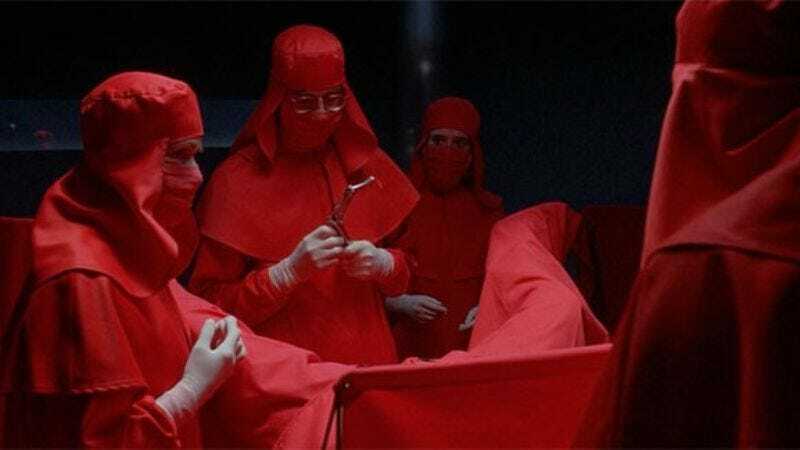 It’s a lurid story about love, family bonds, and some unspeakable acts of experimental gynecology—all leading up to a tabloid-ready conclusion—but Dead Ringers plays it with rigorous discipline and restraint. Through Cronenberg’s lens, the Mantles are like specimens in a Petri dish, coagulating and splitting apart and finally fusing together again in death. Having established himself as a maestro of intelligent, often bracingly violent horror films, Cronenberg took a turn toward a more “mature” direction with Dead Ringers, moving away from the macabre (slightly) and reining in the explicitness. (Only one scene veers into the abstract, overtly disgusting body horror of The Brood, Scanners, The Fly, and other earlier Cronenberg classics, and it’s a dream sequence.) A loose adaptation of Bari Wood and Jack Geasland’s Twins—itself loosely inspired by the lives of Stewart and Cyril Marcus, identical-twin New York gynecologists found dead due to fallout from their barbiturate addiction—the film fuses elements of a shocking true story with Cronenberg’s pet theme about psychic scars manifesting themselves on the body. It may be the outright creepiest movie in Cronenberg’s filmography, and only partly because of the twins’ occupational abuses. After the childhood prologue, and a second prologue where they win a prize at Cambridge University for patenting a new retractor, Dead Ringers settles in Toronto 1988, where the twins, now played by Jeremy Irons, have set up a state-of-the-art gynecological clinic. Their brilliance as doctors and scientists is matched only by their severe moral and ethical deficit. Elliot, the more confident and suave of the two, regularly seduces his patients at the clinic; when he’s through with them, his shy brother Beverly substitutes for him, and they look too much alike for anyone to tell the difference. The arrangement is fruitful for both of them: Beverly doesn’t have to overcome his reticence in order to seduce women, while Elliot gets to discard them after he gets bored. In this, and all other things, the brothers are in sync. Having not seen Dead Ringers for at least 15 years until I revisited it for this column, I mainly remembered the creepy symbiosis between the brothers, the creepier use of specially designed gynecological instruments, and that it was maybe the single lousiest date movie ever made. What I didn’t remember is how convulsively funny it is. You can see a little of that in the scene above, where Elliot shrugs at Claire’s conclusion that she’s been shared by both brothers (“I was the one who fucked you first, but I gave you to my baby brother, because you weren’t very good”) and cuts her down again when she calls it the most disgusting thing to ever happen to her. (“I doubt that.”) The Mantle brothers, particularly Elliot, have turned their supreme arrogance into a kind of blood sport. It’s like an occupational hazard: There’s no more vulnerable place for a woman than in the stirrups, and the Mantles exploit their power to the fullest, inside and outside the office. Irons’ talent for the cutting put-down is just a small component of his extraordinary work in the dual roles. As an actor, his range is narrower than a lot of critics acknowledge, and his natural aloofness can often seem out of place or embarrassingly self-parodic when applied to the wrong part. (In that way, he’s a lot like Anthony Hopkins, another heralded actor who’s more limited than people tend to acknowledge.) Dead Ringers presents a serious challenge, because there’s literally no way to tell the Mantle brothers apart in terms of their appearance. Other films would have one twin in glasses and the other without, or perhaps different hairstyles or fashion choices. But Irons can only express the differences between Elliot and Beverly through personality traits, and those are in flux throughout the film, as the brothers gradually drift apart. In every scene, you can tell within a few lines which brother is which, and that’s entirely due to Irons’ precise calibration of where their heads are during different junctures of the movie. The logistics of pulling off a performance like that are hard to fathom, and if Dead Ringers was shot out of chronology—as most movies are— the degree of difficulty is even more staggering. Dead Ringers is, to be sure, a relentlessly chilling, grotesque, and unmistakably Cronenbergian exercise in psychological horror, but “the Mantle brothers’ saga,” as Elliot calls it, is a tragic one at its core. In spite of Cronenberg’s distancing technique, the film is about men who fundamentally cannot and could never comprehend what it means to be human, no matter how thoroughly they’ve plumbed the inner workings of the body. The other side of their hyper-rationality is their failure to understand when rationality breaks down and emotion takes over, not least when it happens to them. Cronenberg plays this schism for laughs much of the time—Beverly’s read on Claire’s clearly gay assistant, for one, is hilariously off base, yet it sends him on a downward spiral from which he never recovers—but Dead Ringers pities the Mantles, too, for having such a narrow understanding of who they are. Ironically, it’s in death that they finally become human beings, with all the accompanying frailty, uncertainty, and tenderness.